Many of us have read the fascinating book “When Scotland Was Jewish” which reveals some of the hidden Jewish history of Scotland over the last 800 years. In past blogs I have also written much about this hidden Jewish History of Scotland over the last two thousand years or more. I have discussed the role of the real life dark haired Jewish beauty Rebecca or Rae who Sir Walter Scott’s Jewish Rebecca draws on while set in an early period of Scottish and English history. This real life Rebecca was the illegitimate Jewish half-sister of Lady Margaret of Flanders. Margaret of Flanders was the wife of the heir to the Scottish throne Prince Alexander MacAlexander and her half-sister Rebecca was his mistress and the mother of his illegitimate children. After the young death of Prince Alexander, Rebecca (or Rae) married firstly Uilleam Earl of Sutherland and then secondly Angus I Mor ( b.1235 d.1296) the 3rd Lord of the Isles (r.1256-1296) as his second wife. Her son by Prince Alexander was Isaac MacRae (also known as MacRath) whose Gaelic name was Iain Alisdair and the English version was John Alexander. He was also known as MacRath Amuligane. Rebecca’s daughter Mariota married Angus I's son Alexander by his first wife Juliana. Rebecca’s other daughter Isobel or Yochabel Alexander married firstly Edward the Bruce High King of Ireland and then Sir John the 3rd Laird of Lamont. Rebecca was also known as Reine or Reyna which means Queen. Her mother Yochabed or Yochabel was the Flemish Jewish Reyna or Queen who was the Jewish mistress of Count Gui de Dampierre of Flanders. Some of the anti-Jewish Christians referred to these Jewish Queens as Jezebels and Isabella was a popular name of females of this dynasty. Rebecca or Rae was the first Scottish Reine or Reyna and her daughter Isabella (Yochabel) was the second. Thus these Dark Jewish Queens were sometimes married to the Dark Kings but were a separate institution within the Jewish community of Scotland. The third Dark Reine or Rae was Mary Isabella Lamont the granddaughter of Rebecca. There was also another lineage known as the Fair or White Jewish Queens Malcah Bahira who descended from the red and blonde haired fair skinned Khazar Princesses who came to Scotland in the 11th century. The word used for them was a wordplay or pun on the Hebrew word Bahir for fair and the name of the Khazar state of Bihar in Hungary (Transylvania). These blonde or Fair Queens descended from Princess Adiva a daughter of King Alfred the Great of England and Wessex. She married the Khazar King Menachem who was also known as Menumarot as the Ruler of Bihar. The Scottish Gaelic version of Rebecca is Beathag or Bethoc. Rebecca as Beathag de Gui in translation became reversed as Giles de Burgh and it is most probable that Rebecca married as the third wife to James Stewart the 5th High Steward of Scotland (d.1309). Others have incorrectly identified his wife as Egidia a daughter of Walter de Bourgh. Rebecca was the mother of Walter Stewart the 6th High Steward of Scotland (b.1297 d.1326). It is believed that Rebecca outlived her son Walter (Vidal or Chaim). James Stewart's mother Lady Jean of the Isles was a Jewish Princess of the Isles the daughter of Prince or Lord James (Jacob) of the Isles (descended from the Khazar Scottish Jewish King Shlomo (Somerled/Sorley/ Solomon) of the Isles) and his wife also a Scottish Jewish Khazar Princess Ragnhild (Rachel) of the Isles. Thus Rebecca was the grandmother of the crypto-Jewish Catholic King Robert II Stewart of Scotland. 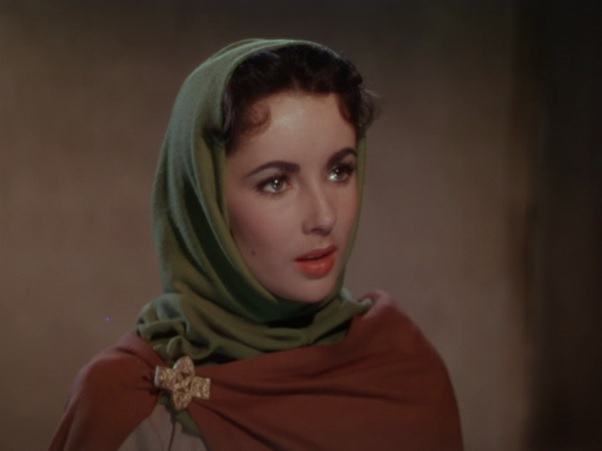 Like the Rebecca recounted in the Ivanhoe story of Sir Walter Scott, the real life Rebecca left Scotland with one of her daughters for Granada sometime after the death of her husband James in 1309. Her daughter Lady Alice (Ailis) Stewart (she took the Muslim name of A'isha) married a Muslim prince Ismail who would become the Sultan of Granada. Rebecca's grandson by Ismail was Yusuf I (also known as Abu-I-Hayyay) of Granada b.1318. Like Scott's Rebecca it is possible that Rebecca left Scotland due to accusations of witchcraft as she was known like her grandson Yusuf of Granada to have prophetic and healing powers. Nasr the crypto-Jewish Muslim Sultan of Granada (d.1322) married Rebecca around 1310 and built her the Torre de la Reine. It later became known as the Torre Abu-I-Hayyay before once again having a name change in the reign of Charles V and being known by a variant of its original name - Peinador de la Reina. Her daughter Miriam (Mariam) by Nasr left Granada after the death of her father and lived in Portugal where she took the name Maria Anes and married the Commander or Governor of Santarem - Soeiro Mendes Petite. One of her daughters called Constance married Pedro the illegitimate son of King Peter III (Pedro) the Great of Aragon and his Jewish mistress Inez. Another daughter Maria married Estavao Perez Coelho a troubadour. The Catholic Princess Isabella of Portugal the wife of Charles V was descended on her direct maternal line from Maria and thus from Rebecca (Rae or Reine) the Dark Jewish Queen of Scots. In a past post I speculated that the name of Amuligane or Molegan came from the Hebrew haMelekh haKatan which means “the Little King”, however it could also be haMelekh haKohen which means the Priest King or from HaMelekh Khaghan. Another possibility is HaMelekh haKeheh which means the Dark King. Hakeheh means the dark one. This title of the Dark King may have referred to the dark hair and skin of Isaac that he had inherited from his mother. This is the reason that this family were associated with the name Dubh (dark or black in Gaelic) or Duncan (a dark or brown warrior) and Maurice (meaning dark skinned or swarthy in Latin). Some of the anti-Semites of the time used this name in alluding to the Jewish king as the offspring of the dark one or Satan. The title Amuligane developed into the surnames Milliken and Mulligan and other variants. The emblem of this Royal Family was the Red Rampant Lion of the House of David representing the Royal Lion of Judah. This was used to demonstrate their descent from Alexander II and Alexander III Kings of Scotland who first used this emblem in its present form as the Royal Scottish Standard and thus claiming Royal Davidic descent from both David I of Scots and King David of Israel. King David I of Scotland would seem to have been the first Scottish King to use the emblem of the Rampant Lion. He was perceived by many Jews as a Messianic Davidic figure and through St Margaret he was of Royal Khazar Jewish ancestry. The Milliken coat of arms has three rampant lions which are red but originally the three were different colours of red, blue and black (sable). The Red Rampant Lion represented the Royal House of the Khazar Jews and the Scottish Kings of the House of Atholl-Dunkeld, the Blue Rampant Lion represented the Lion of Judah and the House of David and the Black Rampant Lion the Counts of Flanders and the Royal House of the Rhadanite Jews. After the death of Prince Alexander, Rebecca fled north to her relatives in Moray and then married the Lord of the Isles. These relatives like Rebecca were descended from the Khazar Royal Kings called Khagan which had in Flanders been adapted to Kohen. Rebecca belonged to the Flemish branch of the Khazar Royal line. I have written in other blogs about the arrival of the Khazar Royal Warriors to Scotland so I will not repeat that now. Isaac was soon given lands in the area of Dumfries and Galloway and had a certain protection as the step-son of the Lord of the Isles. He later became allied with Robert the Bruce through his marriage to Robert's sister Lady Margaret Bruce. Rebecca who was also known as haMalcah haKehah (the Dark Queen) was considered the leader or Queen of the Jews of Scotland and the Isles. Malca Kehah was the origin of the MacKay name and her son Isaac is also known as Iye Mor MacKay in the MacKay genealogies. Isaac I's son Daniel MacIsaac was also known as Donald MacKaheh or MacKay. 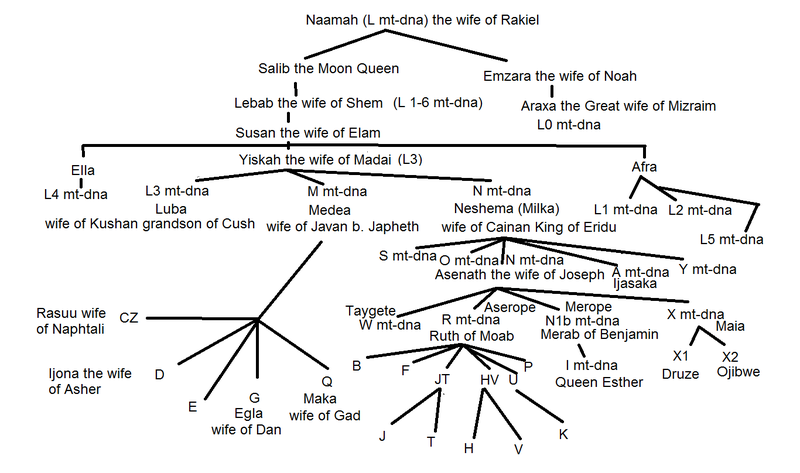 Daniel married the MacHeth or McEth heiress. Rebecca was the true 1st Chieftain[ess] of MacKay. Rebecca’s father Count Gui de Dampierre was known as Guy de Cahan in the Scottish genealogies. 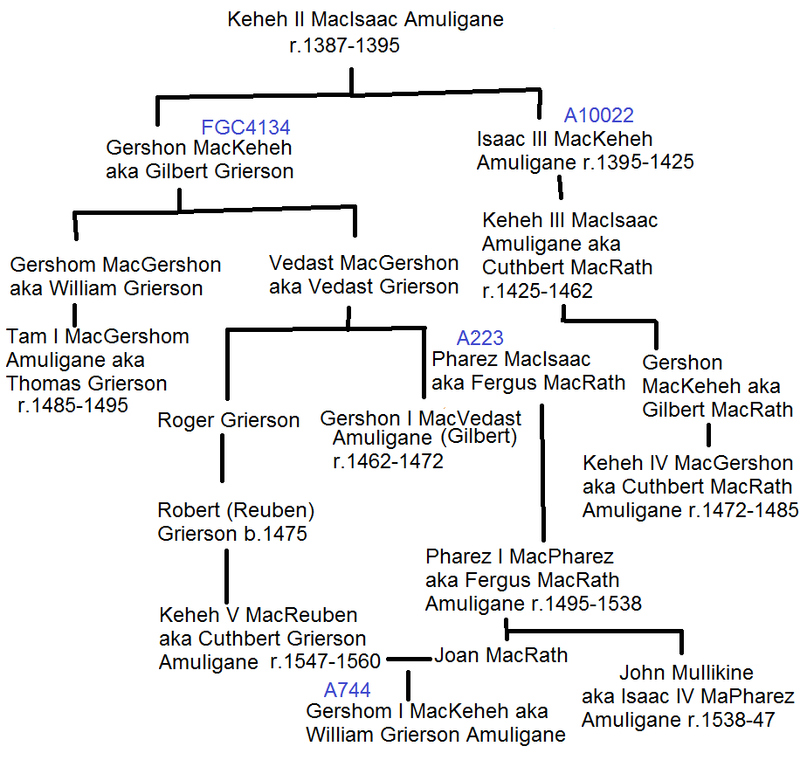 Some of her descendants also took the name of MacGui (MacGhie) or MacGee. Mary MacGee married into the MacDevitt family and their son John took the MacGee (MacKee) surname and was the ancestor of the ZZ36 y-dna haplogroup. Gui's original Jewish name was Gershon. 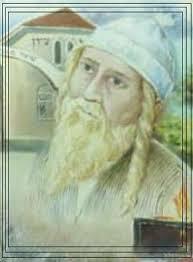 His mistress and the mother of Rebecca was a descendant of Rabbi Isaac of Dampierre (b.1120). However his name of Gui was connected to his nickname in Hebrew of Keheh (Dark one). Gui's coat of arms was a sable or dark rampant Lion which he wore on his surcoat. Rebecca’s son Angus II Og MacDonald, by her husband Angus I, became the 5th Lord of the Isles after the death of his half-brother Alexander II Og MacDonald in 1299. Rebecca’s son Isaac was revered as being a Jew who was also the son of the last male heir of the older Scottish Dynasty of Dunkeld-Atholl. He was perceived as a Jewish sub or under King over those Jews who still practiced Judaism in quiet and private ways in Scotland, even those of Jewish origin who were members of the Catholic Church revered Isaac as a kind of mystical Davidic priest-king. He became the second Earl of Sutherland under the name of Uilleam or William on the death of his mother's relative Uilleam (Gilleoin) or William de Moravia the first Earl of Sutherland when he was a small child. The names of Isaac and William had first been connected when Isaac Kalonymus became known as Isaac Gellone and then Gellone became associated with William (Guillaume/ Guilelmus) in 8th century Septimania. Isaac's uncle Nathan Kalonymus (Gellone) was also called Guillaume de Gellone or William of Orange. The first Earl of Sutherland may have been Rebecca's first husband who she married in 1283-4 after the death of Prince Alexander. It was after Uilleam's death in 1286 that she married Angus Mor MacDonald Lord of the Isles. 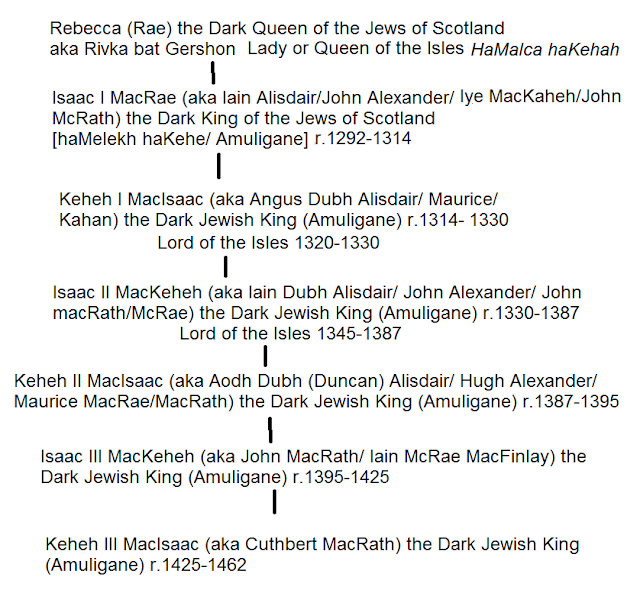 Isaac I MacRae (b.1282 d.1314) was succeeded in 1314 as Scots King of the Jews (or the Dark King) by his son Keheh I MacIsaac (or Kahan I) whose Gaelic name was Angus Dubh Alisdair (also known as Maurice MacRae or MacRath). In 1320 he succeeded his half-uncle Angus II as Angus III MacAlexander the 6th Lord of the Isles (r.1320-1330). Angus may have been the the Earl of Sutherland from 1314 under the name of Uilleam or William (Gillanders). He has been often confused by historians with his half-uncle of the same name of Angus. His wife was known as Agnes MacDonald Cahan and she was the daughter of Alexander II MacDonald and Lady Mariota Alexander of the Isles (the daughter of Rebecca). Keheh I (Angus) had a brother Gershon MacIsaac who was also known as Gilbert de Insula who was granted lands in Menstrie in 1330. Another brother Chanan MacIsaac was known as Kenneth de Moravia the 4th Earl of Sutherland. His nephew Chanan MacKeheh was also called Kenneth (Kenzie) the 1st Mackenzie Lord of Kintail. He was the Mackenzie ancestor of the R1b M222 DF104 ZZ55 y-dna haplogroup. Keheh I MacIsaac was succeeded as the Scots Jewish King by his son Isaac II Pharez MacKeheh (b.1320 d.1387) who was also known as Iain Alisdair or John Alexander as well as John MacRath or MacRae. His half-cousin John MacDonald of Islay the son of Angus II Og macDonald had succeeded his father as Lord of the Isles in 1330. 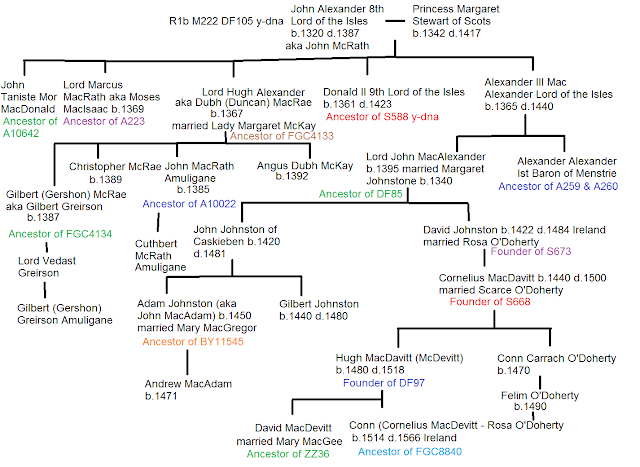 On his half-cousin’s death he married his widow Amy Ruiari (MacRory) and became the 8th Lord of the Isles as John II MacAlexander (MacAlisdair) in 1345. He married a second time to Princess Margaret Stewart the daughter of King Robert II Stewart. Robert II’s wife Elizabeth Mure, the mother of Princess Margaret, was a maternal granddaughter of Isaac I and his wife Lady Margaret Bruce (who may have quietly embraced Judaism on her marriage to Isaac I). It is most likely Isaac II (aka John Alexander Lord of the Isles) who was the founder and ancestor of R1b M222 DF105 y-dna. Isaac II as John II Alexander Lord of the Isles continued his cousin's support of Robert Stewart. In 1366 when King David II tried to raise a tax for his ransom, John rebelled and held out the longest. In a Treaty in 1369 John was reconciled to King David. King Robert II however decided to divide and conquer by granting certain parts of the Kingdom of the Isles to be inherited by the step-children of John (the children of his first wife Amie by his cousin John I McDonald) and the rest to John's own children by Princess Margaret Stewart. He was succeeded as Lord of the Isles by his son Donald. Around this time there seemed to be an increase of the rate of mutations in the y-dna with the advent of the Little Ice Age due to cataclysmic events in the southern and possibly western hemispheres around 1320 and then again in 1530 and 1605 thus deepening the effects of the Little Ice Age. 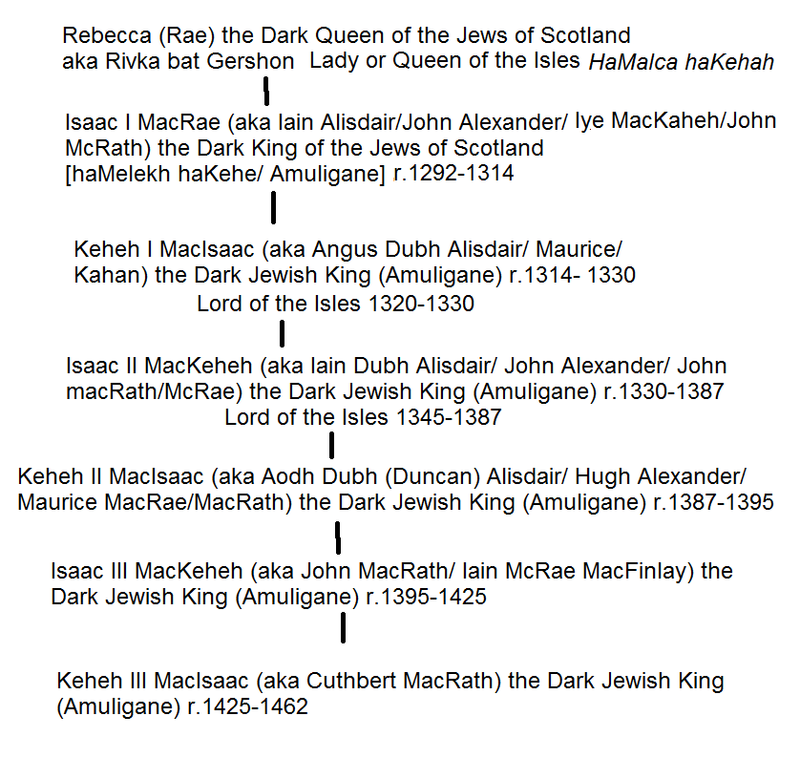 Isaac II was succeeded as Scots King of the Jews by his son Keheh II Mac Isaac who was also known as Hugh Alexander (Aodh Alisdair) as well as Dubh or Duncan McRae as well as Maurice MacRath. Keheh II as his name suggests was dark haired and olive skinned and his wife Lady Margaret McKay was blonde with fair skin and was known as Mariota Fionna (Margaret the Fair). Margaret was the Fair or White Jewish Queen (Malcah Bahira / Banrigh Fionn/ Rigain Fionn). Two of their sons Angus (Keheh) and Gilbert (Gershon) had the dark looks of their father and were known as MacDubh. Two of the sons Christopher (Chaim) and John (Isaac III MacKeheh) had the fair looks of their mother and were known as MacFinlay. Keheh II (Kahan II) was the founder and ancestor of R1b M222 FGC4133 y-dna. Hugh or Keheh II had been chosen to succeed his father as his older brothers embraced the Catholic Church. His younger brother Marcus (aka Moses) also remained a Jew and some of his descendants were also known as Amuligane as the Dark Jewish King. Marcus married the Jewess Amy McDonald who was a maternal great granddaughter of Rebecca through the Campbell and Lamont families. Keheh II's brother Donald was the 9th Lord of the Isles and the founder of R1b M222 S588 y-dna. 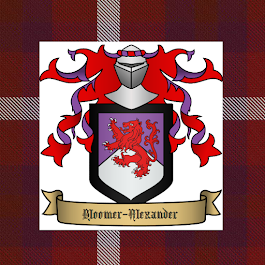 He was succeeded by his brother Alexander III MacAlexander Lord of the Isles who married Lady Mary Lennox and his son Alexander the 1st Baron of Menstrie was the ancestor of R1b M222 A259 and A260 y-dna and his other son John MacAlexander was the ancestor of R1b M222 DF85 y-dna. 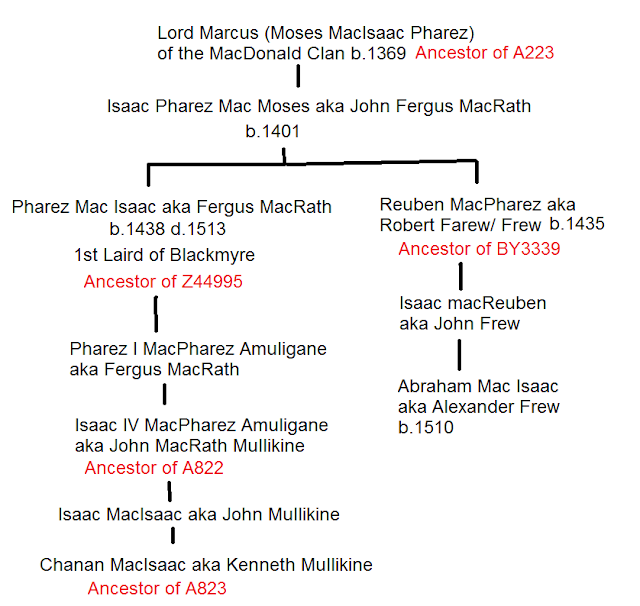 Isaac IV's relative Abraham MacPharez (aka Alexander Frew) b.1510 a great-grandson of Isaac Pharez MacMoses (aka John Fergus MacRath) became the ancestor of the Farew or Frew family of Ayrshire (Kilwinning). Abraham's grandfather may have moved from the Blackmyre region of Nithsdale to Perth in the north and from there the Frew family branched out to Kilwinning and Kilsyth and the area Gargunnock and the Fords of Frew which was named after this family. However it may not have been Nithsdale that the Frew's moved from but further north of Perth from the Glen Tilt area that they moved to Perth while the MacRath/Amuligane branch moved to Blackmyre. 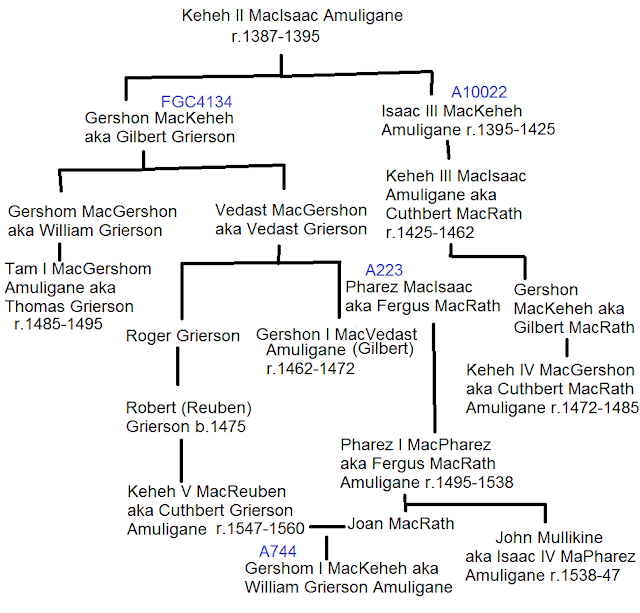 Isaac IV's son Isaac MacIsaac (John Mullikine) was the belonged to Z44996 y-dna. His grandson Chanan (Kenneth Mullikine) was the ancestor of A822 Y-dna. The fourth Dark Jewish Rae or Reine (Queen) was Helena Campbell (b.1348) the daughter of Lady Mary Isabella Lamont (b.1318 d.1364). The fifth Queen was Lady Amy McDonald of Islay the daughter of Helena Campbell. Amy was the wife of Marcus (Moses) MacRath whose brother was the Amuligane or Dark Jewish King. Amy's daughter Isabella MacRath married Isaac III MacKeheh. The mysterious figures of Rae (Rebecca), the MacIsaac family and the Amuliganes reveal a rich hidden Jewish history of Scotland. When I was younger I often heard of the Scots being referred to as the Jews of the North. Cecil Roth in his writings sought to explain this Jewish input into Scotland by suggesting that many children from English Jewish families had their children taken off them in the Medieval period and sent North to the border region of Scotland and England. However it was the input from the Khazars (MacDonald) Kings or Lords of the Isles (of R1a y-dna) and the Flemish Jews of Flanders that were the major source of hidden Jews in Scotland. 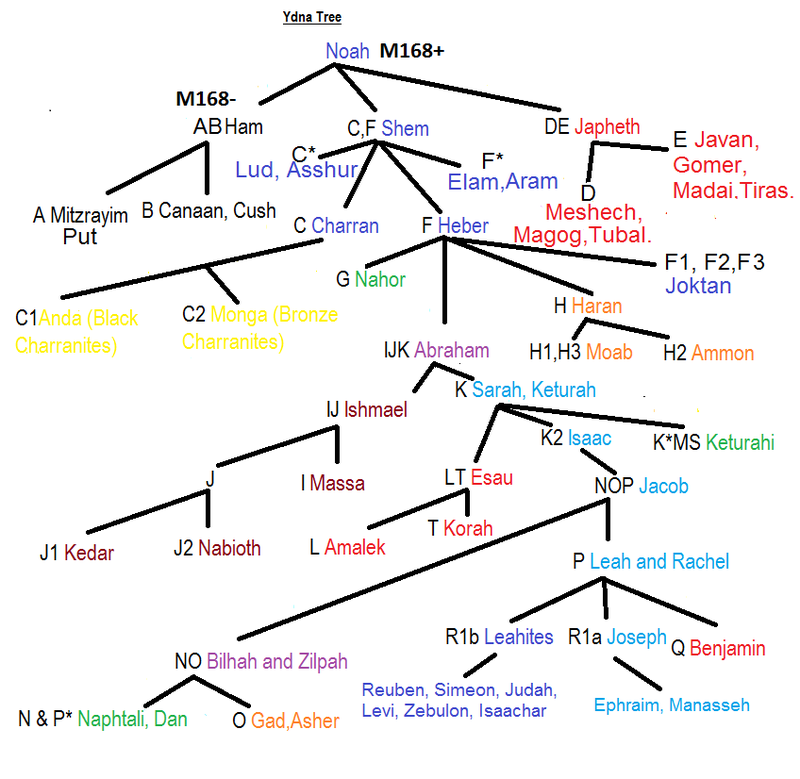 It was the MacDonald Clan that was the overarching shield of these various Jewish families and then the MacKay (Ikey Mo) Clan that had its origin within this MacDonald Clan among some of the descendants of Rebecca and Isaac. It is also important to note that these Flemish Jews that are the ancestors of Rebecca's parents are not only those of Khazar ancestry who most likely enter Flanders from the Khazar kingdoms of the Isles and Moray (Moravia) in northern Scotland but of their intermarriage with the Rhadanite Jews of Flanders and France which may have a link to the Rhodan and Synklar Jews of Calalus who also arrived in Western Europe in the 10th century. This is a further area of study and research that will reveal more of the hidden Davidic, Jewish and Jewish Catholic history of Europe and the world which was hidden or obscured firstly by Gentile Catholics and Christians as well as Rabbinic Jews and later by the modernists in academia and science. Among certain groups there are those that argue vigorously for certain ancestry for their families or nationalities. The reality is that those today who are Scottish or Irish and their more recent descendants in other countries are not purely Norwegian, Gaelic, Norman, Pictish, English, Flemish, French or Jewish but they are descended from all these groups no matter what origin the direct y-dna or the direct mt-dna reveals. It is not just those with the y-dna R1b M222 DF105 and mt-dna J1b1a1 that descend from Rebecca and her sons and daughters but those of many different haplogroups that they intermarried with so that today probably most Scottish people and probably most Irish and English people descend from Rebecca in some manner. This does not mean all these people are Jewish but it does mean they have some ancestors that were Jewish. Some of Rebecca's descendants very quickly became Catholics but these Catholics still retained their Jewish halakhic identity for 10 generations if it was on a direct maternal lineage after leaving the Jewish community. Others maintained in family and hidden groups their Jewish identity until at least the 17th or 18th century before assimilating into the Christian population.